Unfortunately for Syrians, most of their Internet access is brought to them by a company called SyriaTel, which is state-owned. "They buy most of their Internet transit from Turk Telekom and Deutsche Telekom, with some contribution from PCCW, Tata, and Telecom Italia," Renesys said. "Connectivity has historically come in over submarine cable from Cyprus; activation of new terrestrial fiber connections to Turkey have been delayed by this year's political unrest." Well, what about the other third of the networks, some might ask? Unfortunately, Renesys said that all of those connections belong to the Syrian government. Of course the country’s Oil Ministry Web site is still online, as is Syrian Telecom’s official page, but government sites like the Ministry of Education, the Damascus city government page and the Syrian Customs site are all down. Although Renesys had lots of great information, they did not have any evidence of what specific regions or cities were affected by the outages or how the massive outage was coordinated; however, they did say that "if Egypt and Libya's Internet outages are any guide, one might conclude that events on the streets in Syria are reaching a tipping point." Google confirmed the outages in Syria via its Twitter account, tweeting on Friday afternoon: "Google services currently blocked in Syria." 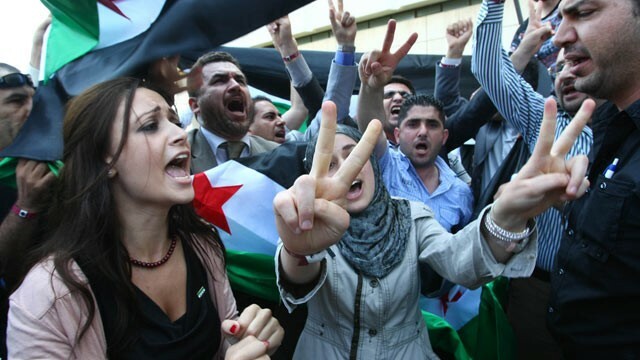 For months the citizens of Syria of have been protesting against the conditions of their country, but according the Washington Post, the real turning point for everything was this past Wednesday. The Post reports that more than 300 opponents of the current Syrian president, Bashar al-Assad, held a meeting at a hotel in Turkey to discuss what their next move should be. According to the Post, "It was significant that the government's opponents were finally coming together to try to present a united front to a world that remains skeptical about the Syrian protest movement." Just this past February, there were reports that the Syrian government was planning to lift the then current bans on YouTube and Facebook. These bans had been present for over four years and were supposed to be lifted due to the “popular upheaval” about the situation. In the past year, there has been plenty of civil unrest around the globe. Protest and violence exploded in the Middle East in Egypt, Libya, Yemen and Syria. In January Internet services went down in Egypt for a couple days, due to the protests concerning the country’s governmental issues, including the nearly 30-year rule of its “President” Hosni Mubarak. In March Internet services were also disabled in Libya due to similar issues and protests. The outages in Syria, however, ironically occurred on the same day that the United Nations released its Special Rapporteur on Freedom of Expression. Frank La Rue’s report discussed the recent increase of governmental restriction on the flow of online information. He noted that this was mostly due to the Internet’s ability to unite individuals together in protest of something; however, in his report he encouraged governments to not restrict their country’s citizens' Web usage. He instead asked them to work on developing a plan that would make the Internet widely available, accessible and affordable to all. "The report by the Special Rapporteur raises concerns about justifying broad surveillance powers under the name of national security or counter-terrorism," said the U.S.-based Electronic Frontier Foundation in a statement. "La Rue should be commended for questioning the ostensible motives for online surveillance." "As Rapporteur La Rue affirms, the Internet's unique ability to provide ample space for individual free expression can lead to the strengthening of other human rights, including political, economic and social rights," said Cynthia Wong, the Director of the Center for Democracy and Technology’s Project on Global Internet Freedom. "In order for these rights to be realized, governments, civil society and industry must all continue to build on the work begun by the Special Rapporteur."